The CJ3A Page Forum - What '3A parts do you save? Or throw away? The CJ3A Page Forum › TECH FAQ SECTIONS › EVERYTHING ELSE, General tips › What '3A parts do you save? Or throw away? So I've got my CJ, and it's almost complete, I've got another hobby car (Pontiac GTO), and I can foresee me perhaps getting a British sports car project in the next few years, so that means I can't store a ton of parts. I've got some parts piled up that I was going to haul to the dump, but then my "old yankee" thriftyness kicked in and I'm wondering if I should save some of it. I've got a few waterpumps that aren't any good; should these "cores" be saved for possible rebuilding? I've got a rusty pressure plate....save it? front spring packs....some leaves aren't good, but the longest ones are good...should I save them/give them away? Or haul 'em to the dump? I've also got the seized engine that came with my Jeep, but I'm still thinking of ripping it apart sometime....but still, it all takes precious room. Just wondering what you guys save vs. throw away. Re: What '3A parts do you save? Or throw away? Interesting question. I look forward to seeing what others hold on to too. I have a few Willys CJs and no other collectible autos so I've chosen to keep a larger collection of items than you, but I have limited space and other hobbies. I carry a number of items on the Jeeps that have been known to fail while on the trails. In the shop, I have a couple spare engines, TCs and a transmission. Some drive shafts. A few starters, a half dozen carburetors, and shelves full of small items including electrical stuff, gasket sets and small bolts ons. I do have larger items I should probably get rid of, but I haven't been able to bring myself to do it. A number of old hoods, windshields and sets of wheels that aren't for the CJs, but were on mine when I bought the Jeeps. I have a completed M38 and a project 3A. While closely related mechanically, they are 2 different animals concerning fuel, ign and elect systems. High on my list are 636SA & YS637 carbs, fuel pumps, gennys (12 & 24v), dizzys, starters. I've got a spare RMC M38 eng on the stand (I've never run it), T90 & D18 both need work, NOS D44 ring and pinion 5:38. These are things that if you have, you'll never need (I just tempted Mr Murphy I know). The spare hoods with the stupid hole cut for engine swaps can go away after i cut the Willys logos out. A couple of tailgates and grilles live in a nice place on the barn wall.. I see ads all the time for lots of Willys parts around here. 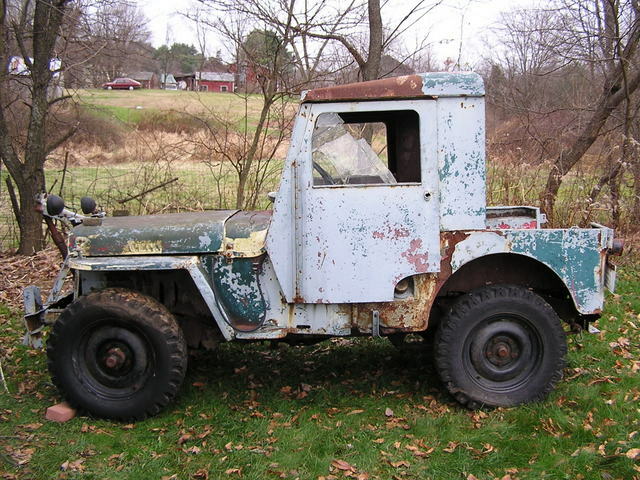 There are still quite a few Willys CJ's (parts rigs, and even some rebuildable units) even in New England. But I know the day is coming fast when these parts vehicles will thin out. So I can see the logic of keeping spares. I see folks complain all the time about not even being able to give away axles and things like that, but the day will come when D41's and D25's will become quite scarce. My trouble is I just don't have lots of space for stuff. Hmmm, I want a Willys wagon too....DANG it! Haha. As a side note, I'm jealous of you guys in the west. I've been in CT for 18 years and dirt roads and trials have all closed up. I don't know ANYWHERE just to go putt-putt up a hill or something. It's terrible. Being a pack rat at heart, I never (almost) throw anything away. Since retirement and failing strength, I've had to face the fact that I have to get rid of some stuff including a couple of complete, running Willys. I'm fortunate to have a three car garage with a loft so everything is still here for now. It's time to move three transmissions, a couple of 3A/3B air cleaner assemblies, an M38 windshield, a couple of PTO assemblies as well as an L6-226 short block and a two barrel manifold for it. Mostly big, heavy stuff so I need to drive out to Ohio for the next Willys Reunion. That's the best way to pass on that kind of stuff. Somebody will want it. I keep pretty much ALL the small stuff.